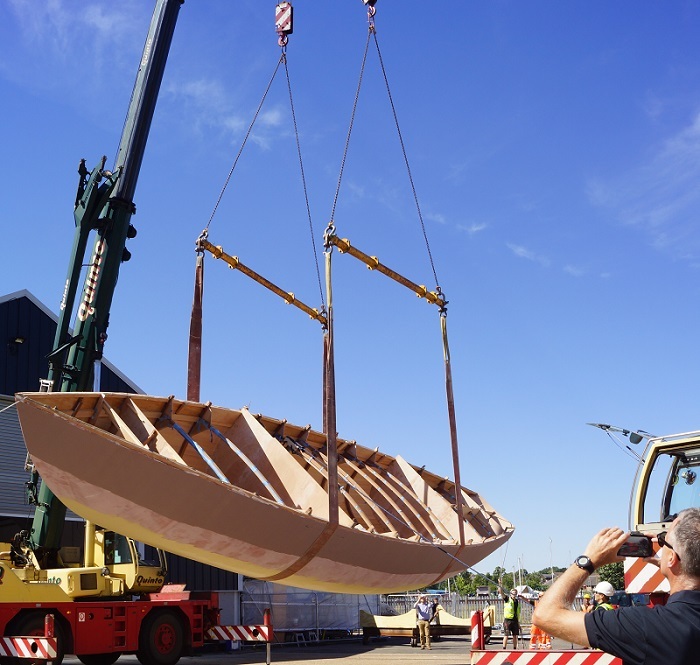 If you walk along the dock at Ipswich Haven Marina in Suffolk you will hear a cacophony of boat building sounds coupled with the faint, earthy aroma that only high-quality timber exudes. If you popped your head into the Spirit Yachts yard you would see the equivalent of a Santa’s Grotto for boat lovers. As you enter the yard, the imposing, smooth wooden hull of the 34m Spirit 111 is towering above you. 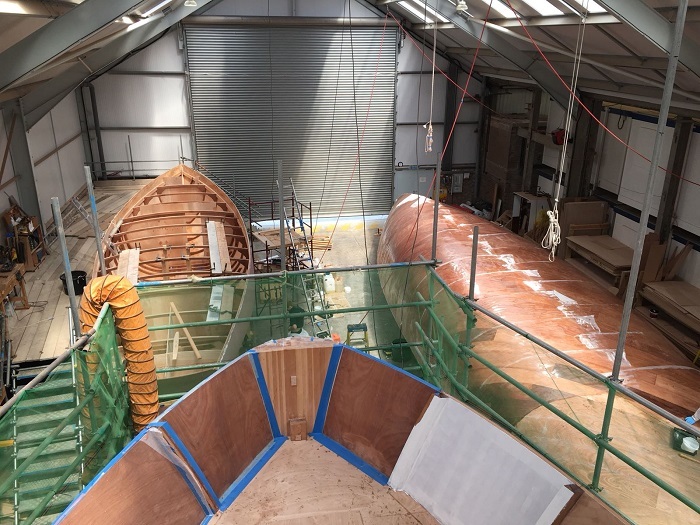 From a higher vantage point, you can see down into her vast interior, which is being fitted out by an army of highly skilled boat builders from the UK and much further afield. 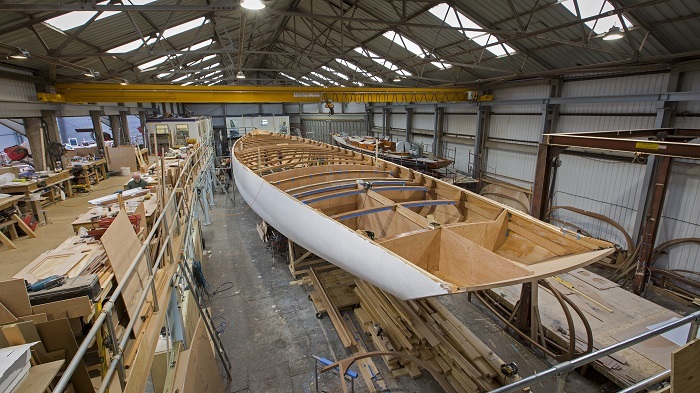 Elsewhere, bespoke furniture is being made for the saloon, which will need to be lowered into the interior before her coachroof can be fitted in the autumn. In the adjacent yard, the first thing that catches your eye is the powerful looking Spirit P70, the largest motor boat to be built by Spirit Yachts to date. As you climb aboard and navigate your way around the decks and into the interior, you will see makeshift ‘welcome’ signs in the different languages of the team who are building her. The joiners are hard at work fitting the woodwork for beds, cabinets, desks and chairs and outside her deck spaces are taking shape. In front of the P70, are the new Spirit 50CR and a Spirit DH65. The 50CR is a 15m cruiser-racer that will launch in the summer next year. 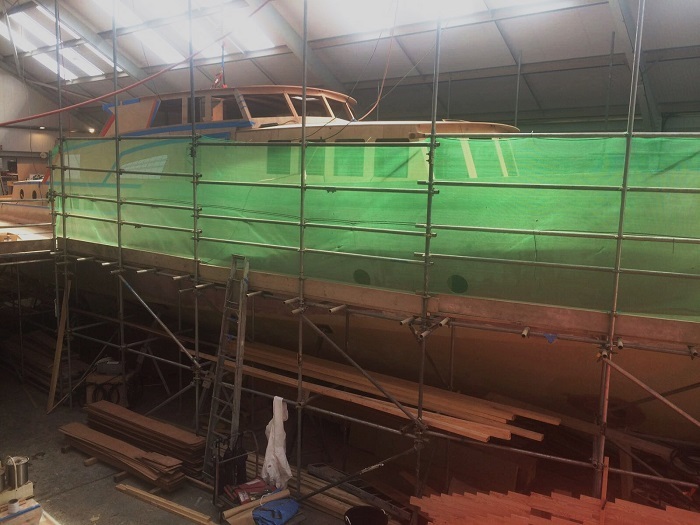 She has recently been rolled over and is in the initial stages of internal fit out (see rollover image below). Alongside the 50CR is the smooth hull of a new Spirit DH65. She is a deckhouse design with an electric drive unit that will have regeneration capabilities. The team at Spirit has been able to redesign the raised coachroof and the aft cabins as the electric motor takes up half the size of a diesel. This will give the owner larger accommodation space and a wider walk-through to the saloon from the deckhouse. The Spirit DH65 will also be fitted with variable speed air conditioning, electric cooking and a super-efficient hot water system; all of which will be similar to the Spirit 111 project but on a smaller scale. Options for further power generation, such as solar, are being discussed. Keep an eye out for updates as the build progresses.